WASHINGTON - The Senate may pride itself on a reputation as the world’s most exclusive deliberative body, but it is turning into just about the only place in America where a self-described socialist can wield raw power. Senator Bernie Sanders of Vermont has spent his career trying to remake American capitalism in a more Scandinavian image. His favored targets of late have been top finance regulators he considers far too deferential to Wall Street. Last year, Sanders spent five months trying to block a new Commodity Futures Trading Commission chairman before securing promises from Gary Gensler to aggressively fight market excesses. Sanders, however, seems to be hoping that this particular adventure ends not with a peaceful detente but a spectacular confrontation. “I’m going to do my best to defeat him,’’ said Sanders. Congress’s only self-described socialist, the 68-year old Sanders gives the appearance of having stepped in from a tornado and speaks as though still trying to be heard over the noise. His voice may finally be breaking through. Over 16 years in the House, his lonely crusades - which amount to a lifelong campaign to remake American capitalism and social policy - were usually received as little more than glitches in an otherwise well-functioning two-party system. Since his 2006 election to the Senate, however, Sanders has found that a junior senator’s single vote is enough to keep him in the middle of things. He has emerged as a one-man tea party within the Democratic ranks, an ideological purebred feeding on outsider anger while staying close enough to party leaders to win rewards for his loyalty. Sanders disappointed liberal allies who had counted on him to mount a one-man stand against the Democrats’ health care bill for omitting a public insurance plan. Sanders, who had introduced an amendment to create a single-payer plan, had initially threatened to oppose any such bill without a public option. Now Sanders is working the backroom negotiations between House and Senate leaders, to defend his rural health funding and possibly win a further boost. This year, Sanders may settle on a fresh target: a proposed Comcast-NBC merger. He is working with staff over the winter recess to determine the best way he can wield his senatorial clout to potentially disrupt a deal he fears could establish a new monopolistic media force. “I think in a democratic society, you don’t want one or two institutions controlling the flow of information,’’ said Sanders. A longtime critic of mainstream media, Sanders controls the flow of his own information. He wrote radio ads for his congressional campaign with friends around his kitchen table. Before being elected mayor of Burlington in 1981, Sanders developed educational film strips about New England history - and one 30-minute documentary about Socialist presidential candidate Eugene V. Debs - for sale to local schools. When Greenspan said that American workers benefited from the world’s highest quality of life, Sanders corrected him in the language befitting a man raised in 1950s Brooklyn. “Wrong, mister,’’ Sanders said. Sanders said he had not given much thought to Bernanke’s future until he faced him down at a similar hearing last fall. 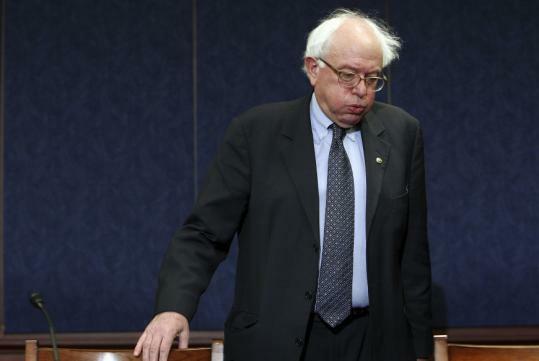 When the central banker dismissed his request for a full accounting of banks receiving Fed loans, Sanders - who had voted against the TARP bailout a year earlier - says he lost confidence. “The lesson is, if you give unlimited power to people whose whole function in life is to make as much money as they can based on outrageous greed, that’s what they’ll do,’’ Sanders said in an interview this week. In early December, Sanders placed a hold on Bernanke’s renomination, one of several, from both parties. In practical terms, they are unlikely to deny Bernanke, who was first appointed by George W. Bush, a renewal when his term ends on Jan. 31. It will, however, force Obama to secure 60 votes, rather than 50, to keep Bernanke in place. This week, Sanders insisted that he could not be accused of the same tactic.